RVB: 00:03.841 Hello everyone. My name is Rik, Rik Van Bruggen from Neo Technology and here we are again recording another podcast for our Graphistania podcast series. And tonight I have a lovely guest all the way from California, Mouse Reeve from the Internet Archive. Hi, Mouse. RVB: 00:21.527 Hey, thank you for coming online and doing this interview. We appreciate it. RVB: 00:27.492 We got introduced by the spider in the graph web, that is Michael Hunger. Michael told me a little bit about your projects, but maybe for our listeners, would you mind introducing yourself a little bit? MR: 00:43.548 Yeah, of course. So my project is grimoire.org, which is a website that is built on a graph database that tries to map out historical texts about how to do magic or grimoires. 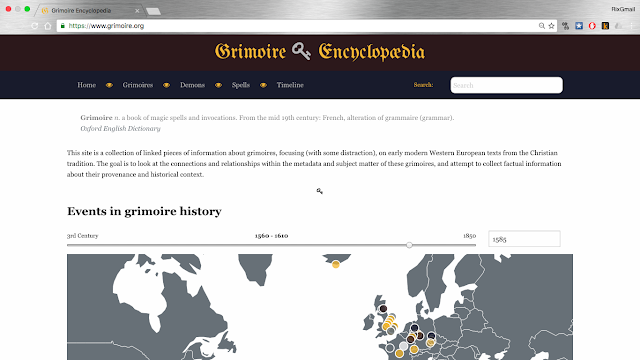 And it looks at that the way in which content and metadata is shared between different grimoires, where that shows up in different times and different places in history. So that's kind of the short version. RVB: 01:14.455 So, help me and our listeners explain a little bit more about what a grimoire is. What should I think about when I think about a grimoire? MR: 01:27.530 Sure. So a definition of a grimoire, I think, technically is a book of magic or invocations. It's a just a book that has practical how-to instructional information about how to do magic and that can be kind of folk magic, like doing spells for healing, or it can be ritual magic, summoning demons, communing with angels. And I'm focusing on grimoires from the Christian tradition in Europe, in kind of the early modern period, so mostly between probably the 15th century and the 18th century. RVB: 02:01.948 Wow, is that a big thing, Mouse? Is this something that used to be something that everyone knew about in medieval times? Or what was this, really? MR: 02:13.146 I couldn't tell you how widely circulated the books were necessarily, but it was definitely really a part of people's worldview at the time that demons and angels were very real parts of people's concept of reality. So the idea that you could summon a demon, or that you could ask advice from an angel, or that a prayer and a ritual was a way to deal with illness or farm productivity was a pretty normal thing that was a part of life, I think, to a degree that's definitely not true today. RVB: 02:48.351 And how does that relate to the wonderful world of graphs, Mouse? How do you use graphs in that domain? 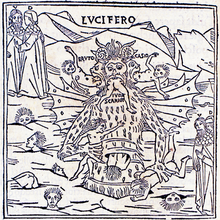 lends itself to connecting pieces of data, like in this case, two grimoires that are connected by another thing, which is like a demon, or a spell that shows up in multiple grimoires. So a graph really lends itself to looking at the interconnectivity of historical data in these texts. RVB: 03:43.098 So that's what you use on your grimoire.org website as well? You spell out those relationships between demons, between spells, and all those such things? RVB: 04:02.650 It's a demon Python script or something like that, no [laughter]? RVB: 04:09.726 Okay, well that kind of sort of relates to why did you use graphs? I mean, what I'm hearing here is that the model is really very much a graph and that's why it's such a good fit for a graph database, right? Is that--? MR: 04:23.586 Yeah, I mean I can kind of imagine if I had tried to use a relational database the massive multiplicity of types of relationships and types of data would've just been-- I would just be writing database migrations all day, every day. RVB: 04:41.932 And now you can just expand them all as you go along, is that it? MR: 04:46.205 Right, yeah, exactly. Not having a strict schema means that I can just enter data and have it be really flexible and reflect the really nuanced and varied ways in which things relate to each other. And it's focused on relationships, which is what specifically I want to look at with these texts. RVB: 05:03.790 And was there anything new or interesting that you discovered because of dealing with this data in this way? Or anything in particular you want to highlight? MR: 05:13.460 Yeah, I mean, I think the biggest thing is finding relationships between texts that I didn't realize existed before. Because a lot of these texts are available online and I try to link up to the full document, but you read a book or you read a PDF and it seems very self-contained. But it's really illuminated the way in which the people who wrote these were communicating with other people in their time and with older texts. One specific thing that I thought was really cool that I found through this was looking at the Sigil of Lucifer, which is pretty iconic. Sometimes I see people with tattoos on the street. And it's usually attributed to one Grimorium Verum that has a version of it that's very clearly the one that the Church of Satan adopted within the last 50 years. But I was able to find versions of it that go back to the 1500s by looking at connections between the content of these books. And so it's really cool to take a book that's relatively well-known and pretty famous, like Grimorium Verum - it shows up in the Hellblazer comic, for example - and see that it actually is rooted in much earlier texts. Then you could trace it back to the Key of Solomon, which is often looked at as unrelated, but has actually roots in the same texts from hundreds of years earlier. RVB: 06:55.733 Oh my god. That is super interesting. It's almost like biblical studies. It sounds a little bit like that to me. MR: 07:01.976 Yes. The Bible is a node in my database [laughter]. RVB: 07:05.619 Is it? That is serious. MR: 07:06.999 Yeah, absolutely. I have biblical quotes. 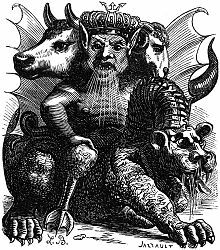 Most demons aren't mentioned by name in the Bible, but the Bible mentions Lucifer and Leviathan. Demonology really is mostly non-canonical. It's mostly stuff that was developed a lot later in history. There definitely are connections to the Bible. And I'm looking at Christian books, so it's important to look at the fundamental script of Christianity. RVB: 07:36.431 Totally get it. Wow. That's super interesting. There's so many actually really interesting projects around this text analysis that involve graphs, right? Even things like the Panama Papers or stuff like that. It's kind of related to it, right? It involves analyzing text and finding links between texts at the end of the day. RVB: 08:03.736 That's really cool. So what's the future hold for this project and maybe for your work in general? Where is this going? MR: 08:11.352 Mostly I'm really excited about new translations coming out of old grimoires. So, a lot of what's on the forefront is me just doing a whole lot more research and fleshing out the data and adding a lot of excerpts and images. I've started adding images to my website finally. I'm also really excited about Neo4j 3 because I use Python and I've heard some cool things about how to work with Python with Neo4j. So I'm starting to look into that. But mostly just I'm going to read more books and add more data. RVB: 08:48.345 Excellent, excellent. And how do you look at the industry around us? You work at the Internet Archive so you must have a perspective on what the industry is going to be doing with this type of technology, or do you? MR: 09:07.456 None of the work that I do at the Internet Archive is particularly graph related. So, I don't know that I could speak to it in that capacity. MR: 09:19.340 Yeah, I mean, I think it's a really interesting technology and I've only used it in side projects. I've used it in a few different ways, but it really lends itself to looking at a certain kind of data and I think that's really promising. RVB: 09:31.936 Excellent. Well, thank you so much for taking the time to have a chat with me about this. I know what I'm going to do right after this call. I'm going to be exploring some of these demons and spells [laughter] just as a bedtime story. But, thank you so much for coming online and it was really, really cool to learn about this stuff. And I'm sure our listeners will think the same. MR: 09:53.714 Great. Thank you so much. RVB: 09:55.576 Thank you, Mouse, and I hope to meet you some day.